The Brexit that people voted for? – For the fainthearted . . . The Brexit that people voted for? Electoral studies covering decades of voting behaviour show there are determinants of how people vote that have nothing to do with politicians or parties. A person’s social class, their age, their gender, and their geographical location are significantly more important than any claim made, or policy advocated, by a candidate. Following the general election of June 2017 in the United Kingdom, expansive claims were made by spokespersons of both main parties, claims that the general election result was a clear endorsement of the policy positions of the party the spokesperson represented. Research by YouGov after the general election suggested that the result was not an endorsement of anything, other than the conclusion that people have behaved as they have always done – voted in a way determined by a complex of factors for a range of reasons, some of them antithetical to each other. When the Prime Minister speaks about “the Brexit people voted for,” one suspects that the pro-Brexit Labour voters in North-East England voted for something very different from the vision of Brexit held by right-wing members of the Conservative Party. 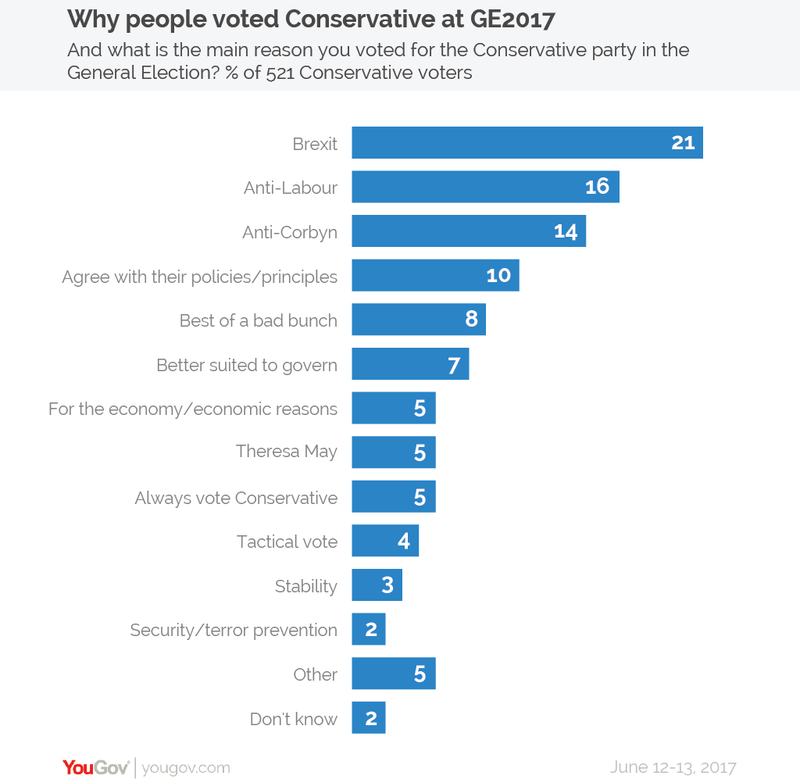 At the 2017 General Election, the YouGov research suggest that just one in five voted for the Conservative Party because of their policy on Brexit, and just one in ten because they supported Conservative policies and principles. The Conservative votes cast because of Brexit or the party’s manifesto seem to be roughly equal with the votes cast because the party was against Labour or against Jeremy Corbyn. Any claim that any policy is one for which the majority of people have voted is not borne out by any research. 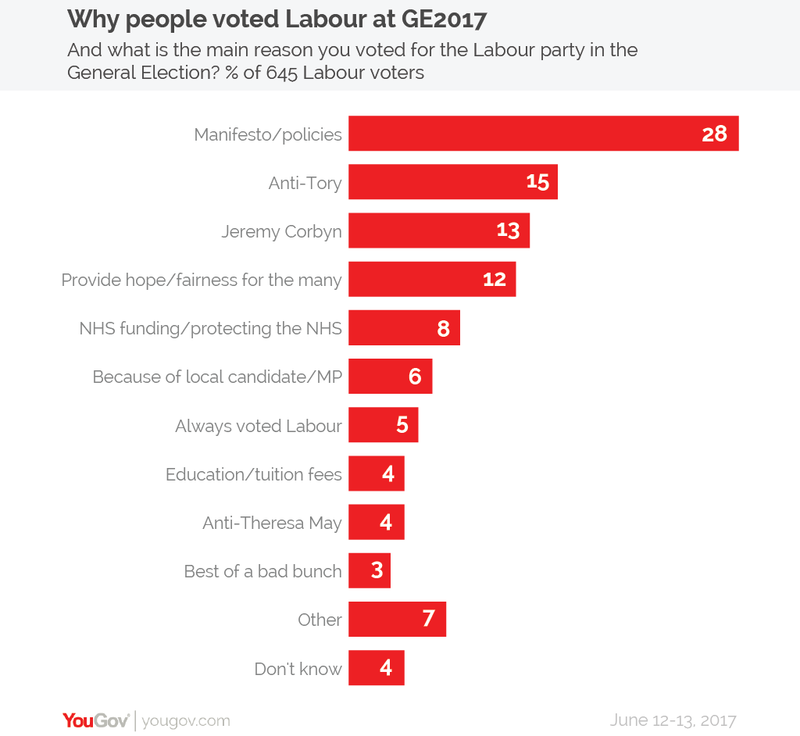 Lest the opposition feel emboldened to claim their own manifesto was endorsed, the YouGov survey found that it was responsible for only 28% of their votes. Even more unfounded was the claim that Jeremy Corbyn was a major factor in the rise in Labour support – just one voter in eight saw his leadership as the decisive factor in their decision on how to vote. Given the fact that people vote the way they do for many and diverse reasons, the Prime Minister’s claim to be pursuing “the Brexit people voted for” is at best a disingenuous statement and at worst a downright lie.